Minor update 156030 has been released! - Addressed issue with changing the status of option "Disable fullscreen optimizations" in Maximization Helper, when the game was installed in "C:\Program Files (x86)\*" location. - Added an information about the "Crowns System and Leaders" option status in a new system message on game start. It should help prevent "I didn't know!!!" excuses on Multiplayer. No, even a checkbox with option "Disable crowns system and Leaders" is replacing the existing "1 territory per player" checkbox. It's impossible to add new checkboxes with any easy method, and it would be pointless. The Welcome message is needed due to YouTubers who record EE2 without mentioning that it uses UP1.5. After that people are asking in comments "my game hasn't got it!". I find that the welcome message is the best non-invading solution. For example other mods change the EE2 logo and textures to have information about it. UP1.5 doesn't change any of those files, so it was almost impossible to identify who was using it. Anyway, the message was added together with the crowns system status. It's mostly useful for the Multiplayer, however this option was so buggy and required so many minor updates that the status information will be very useful in case somebody reports problems with saves/playbacks, etc. - Fixed a bug causing option "DISABLE Crowns System and Leaders" to be enabled every time user entered the Map Editor (so it was impossible to get crowns during the "Test Mission"). - Added fixes to minimize the risk of "Out of Sync" errors in Multiplayer Games, when a Multiplayer Game Save is loaded and crowns in game were disabled. The fix only works on the Multiplayer Lobby (not LAN) and uses the "Keep Alive" Launcher function to work. - Fixed a bug present on EE2: AOS, where option "DISABLE Crowns System and Leaders" was enabled by default after game restart, even when the option checkbox was unchecked. - Fixed a bug where "DISABLE Crowns System and Leaders" option caused the game loaded from a Multiplayer Save to Out of Sync. - Fixed a bug where all new/edited maps caused option "DISABLE Crowns System and Leaders" to be always enabled. - Addressed issue which sometimes caused the "DISABLE Crowns System and Leaders" option being auto-activated when playing on custom maps. So no, an option to disable this message won't be added. Minor update 156031 has been released! - Improved the partial fix for the "Scout Trick" (aka. "Scout Glitch"). Reverted scout-related changes from updates: 156019, 156018, 156017. 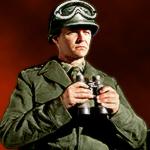 New anti-glitch method, without "punishments": The normal Scout unit will be temporary replaced with a non-blocking "Temp Anti-Glitch Scout (1.5)" unit with aircraft move ability (and no attack ability). The normal Scout will be automatically recreated, after player produce a new citizen. It's to prevent abuses in Multiplayer games. - Fixed missing launcher splash images on Developers Version of UP1.5 (for the other mods). - Fixed possible Mission Timer errors in "e24ever - Hellhole1.scn" scenario. - Integrated e24ever's "The Zombieland" scenario with the EE2 "Single Player" -> "Play Campaign" menu. Thanks to Loewenherz for preparing and improving files. - Added "Restore Default UP1.5 Config" button to Configuration Utility (UP1.5 Settings) window. It helps to restore the newest default configuration file (UnofficialVersionConfig.txt) directly from the EE2.eu Server. This button is disabled for Developers Version of UP1.5. - Improved possibility to re-generate Auto-CD-KEYs from the empireearth2 protocol links. - Added possibility to use the "Installation Validation Checking Tool, created by Dr.MonaLisa", without Support Chat, so we can help directly from the forum.ee2.eu posts, thanks to registered empireearth2 protocols. - Updated DirectX 9 (DX8 to DX9 converter) to improve reliability. - Updated UP1.5 Installers to improve security and reliability. Installers now use more soundtracks (randomly selected). Minor Update Installer now downloads files over HTTPs and shows the number of checked/updated files correctly, with no delay. Minor update 156032 has been released! - Fixed "AI players are not using scouts for exploration on unrevealed maps" bug, which occurred after minor update 156031. There is no logical explanation why this bug appears after adding abilities to scout unit, but it was work-arounded programmatically (assembly). - Updated calsch03's "Survival Egypt (survival game mode)" campaign to resolve issues with custom AI script files not being used. - Fixed "failed to load HTTP.lmd plugin" issues in new UP1.5 installers. Unfortunately, Minor Update Installer will not be longer able to resume downloads in case of connection problems (the file that failed will need to be re-downloaded from the begining). - Updated some texts in UP1.5 Launcher. Optional Minor update 156033 has been released! - Fixed a critical issue where Empire Earth II: The Art of Supremacy could automatically close / crash on start, without giving any error message. It was caused by the growing size of users.cfg file. Minor update 156034 has been released! - Fixed cyan or bad quality icons when "Texture Detail" were set to "Low/Medium" in Game Settings -> Video. Thanks to Loewenherz for converting icon files. - Improved Launcher behaviour when child executables (for example "TwoFingerScroll.exe") are renamed to lowercase (for example after Antivirus quarantine). The Launcher was using case-sensitive filename comparation, was unable to detect if the process is already running and couldn't quit it after game shutdown. - Added new favourite game settings save: "1-15 Nomad (med pace all random)" on player "Coo1" request. - Improved UP1.5 Minor Update installer to display suitable messages when process looks unresponsive. Reduced preparation time by caching list of target files in memory instead of external file. Update 157000 (aka Unofficial Patch 1.5.7) has been released! - Included changes from all minor updates 156000-156034. - New version identification due to core changes: "EE2 1.5.7", "AOS 1.5.7", "EE2 1.5.7-non1.5units", "AOS 1.5.7-non1.5units", "EE2 1.5.7 + Mod", "AOS 1.5.7 + Mod". * Camera zoom settings similar to UP1.4/UP1.5.1 (a huge zoom-out, and first-person view on the ground). * Camera angles set to make the game look as close the official, vanilla version of EE2 as possible. * Fixed the no sounds problem when maximally zoomed-out. This was possible thanks to tweaks of hardcoded sound control values. * It also makes the volume of sound effects (ambient, battles, etc.) more realistic, depending on camera zoom and units distance (even at the standard zoom). * Fixes an issue where units heads were not visible in the preview window (under health bar). * Single middle mouse button click rotates the building (equivalent to CTRL key). * Keeping the middle mouse button pressed for 0.5 second and moving mouse right or left rotates the camera (equivalent to CTRL+ARROWS keys). * Keeping the middle mouse button pressed for 2 seconds, without moving the mouse enables or disables the Full Screen Mode (hides User Interface, equivalent to CTRL+ALT+H). * Middle Mouse Button actions can be disabled or re-enabled by UP1.5 Settings. - Added new improvements to fix maximization problems (directly in the game process). In many cases using Maximization Helper Solutions and disabling fullscreen optimizations will no longer be needed. - Added more AutoSave Settings Frequencies - up to 6 hours 30 mins (before only 30 mins). Autosaving is now possible every 2 mins 30 secs. - Increased the Maximum Air Mission waypoints from 5 to 20 (so you can efficiently plan air routes in CB/RP games). - Unlocked possibility to use the same color for multiple players in the Scenario Editor. - Restored the time after which players are disconnected from the Multiplayer game (from 120 seconds to default 60 seconds). While this change was helpful for players with problematic Internet connections, it could be annoying for active MP users. - Fixed an issue where the number of "Units Destroyed" could be incorrectly calculated and incorrectly shown after game (on "Stats" -> "Military 1" screen -> "Units Destroyed"). - Improved the partial fix for the "Scout Trick" (aka. "Scout Glitch"). Replaced the fix effect "EffectIncredibleDeath" with "EffectCauseDamageOverTime" due to detected issues with the previously used method. * It's now possible to host and start unrated SinglePlayer games (with AI players and 1 human player only) on the Multiplayer Lobby. * Those games are not counted (rating, total games played, total game time) to prevent statistics abuses. * It helps to stay online, receive private messages from friends and be ready to start a Multiplayer session when more players are online. - More improvements and features will be added with time by 157000s Minor Updates. i don't like the new zoom system. Its not more vanilla for me. The Problem is the extremely angles, white that i look over the map. He bothers me, because the greatest map looks now very small and i now to match see the others provinces and players. But i only want to see my own base, and not all the other stuff. Good for me is only the first person view and the battlefield look on the top. My Idea is to set the angle back to the very old vanila stand with a huge zoom-out and a good look near the units. I have test it, and it is better for me. Its stupid, than so we cant se the sky, i know. Maybe you can set the look to the sky over a hotkey? Hi. Could you please attach the screenshot showing the problem? The "knee" angle was set to 30 (default in vanilla EE2). The problem is collision with better-zoom-in, so angles are quite big at the bottom, but then when zoomed out a little bit more - should look the same as on 1.5.6. Either way, nothing to worry about, we can test more possibilities, find better angles and release a Minor Update. When I am at laptop I'll write you details (at the support chat) how to test other values.